Since the inception of home gyms during the late 70’s and early 80’s there have been tons of home gyms produced. Many of these home gyms offer great options for those that are looking to begin their fitness journeys. Others offer a more advanced system with more exercise options and is intended for use by intermediate or advanced lifters. These home gyms come in a plethora of shapes and sizes, providing it’s user with comfort and durability. One great piece of home gym workout equipment is the Body Solid Single Stack Home Gym. The fitness company Body Solid has a long history of providing its customers with an awesome array of different home gym equipment, parts and weights. Their standard of craftsmanship and durability exceed many of its competitors which explains why it offers a lifetime warranty on all its product’s parts and pieces. Body Solid is well known for its great assortment of home gyms that will give you the best workout of your life. All of their home gyms come with well crafted weights that are fully adjustable. This allows you to switch weights incredibly effectively between workouts. The Body Solid Single Stack Home Gym is an incredibly effective home workout machine. This home gym is especially great for those that are just beginning their fitness journey. What is best about having this home gym is that you will not have to sign up for any costly gym memberships. Along with saving you money, you will also save time going to the gym and waiting for a certain piece of equipment to be available. Along with all of these benefits you will have a piece of machinery that will offer you an assortment of different workouts to perform. The Body Solid Home Gym offers you a Lat Pull Down component that is perfect for pull downs. The Lat Pull down will also allow you to do tricep press downs, to help build stronger triceps. The Lat Pull down can also help you perform cable cross overs that will help you build a stronger overall chest. The hold down leg pads are perfect for helping you stay stabilize during all of these workouts. The hold down legs pads are constructed from comfortable foams that will not chafe or hurts your legs during use. The Body Solid Home Gym comes with a mid pulley station that works great for a plethora of different exercises. One of these exercises is Ab pulls as well as other core exercises. 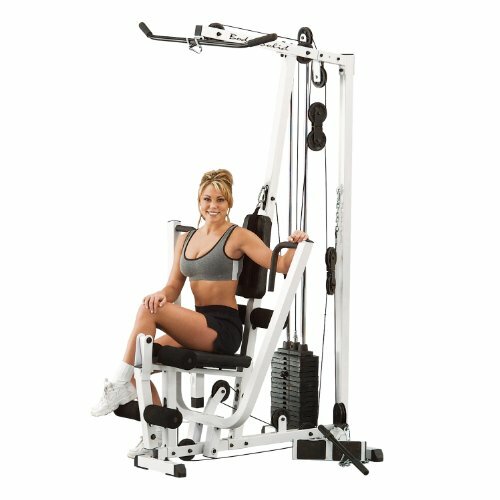 The mid pulley is designed to offer a smooth cable ab row that is perfect for those looking to strengthen their core. What is best about this home gym is the full range of motion that you will have access to. This means that you will be able to completely contract and relax the muscles in your core, causing a more complete workout. Leg Extensions are great exercises for those looking to develop their legs and overall lower body. The quads of the legs can be developed through using the Body Solid leg extension station. This station allows you to perform this dynamic movement from the comfort of a seated position. Along with developing the muscularity of your quads, you can also strengthen your knee joints and add flexibility to your legs. The leg extension also acts as a leg curl machine that is perfect for targeting your hamstrings. The leg curl machine offers you a comfortably adjustable exercise that will help you develop your inner and outer hamstrings. Finally, the Low row/ seated pulley station is an easily adjustable tool that can help you develop your middle and lower backs. The lower back is incredibly hard to target and even harder to properly train. With the Body Solid Home Gym you can effectively target the middle and lower back muscles. This type of training will also help develop your core, which can effectively strengthen your entire body. You can also perform shrugs, leg abductions, ab crunches and bicep curls with the low row. Wide assortment of exercises available. Utility strap that is perfect for ankles and wrist. 160 lb weight stack with 10 pound increments.